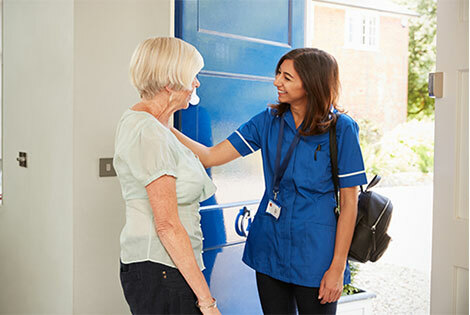 A nursing bag — also known as a healthcare bag, public health bag, medical bag, visiting bag, or supply bag — is a critical part of at-home patient care and has been a staple part of home visits for decades. Visiting medical staff, including nurses, aides, and rehabilitation experts all carry their essentials in a nursing bag during home visits. There are two important parts to any nursing bag technique: stocking it with the appropriate items and keeping it clean to prevent the spread of microorganisms and infections as you move from visit to visit. Below, we explain the essential items you should always have on hand in your nursing bag, and then break down the best technique for keeping your nursing bag as germ-free as possible. You don’t want to leave anything out of your nursing bag, so we’ve outlined 12 essential items below, plus tips for choosing the nursing bag itself. 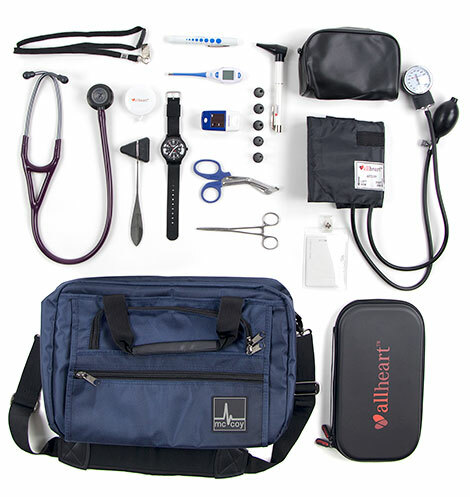 The Bag Itself — The first step to stocking your nursing bag is deciding what type of bag you need. The material of your nursing bag is critical; while many bags have an exterior made of canvas or another type of tough cloth, fabric (even treated fabric) can’t be thoroughly sanitized simply by wiping it down because of the cloth’s porous nature. You should choose a bag with a hard nonporous exterior surface, such as vinyl or leather, that can be disinfected with a quick wipe-down. As for the interior, you’ll want a mix of pockets in different sizes to hold all the various items below. Make sure the handles and/or straps are comfortable and easy to grip or wear. 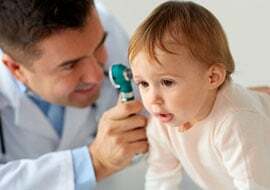 Stethoscope — Stethoscopes allow you listen to the heart, lungs, bowels, and many other body parts for signs of irregularity. They’re some of the most important pieces of equipment for any medical professional, and should be one of the first (if not the first) items you add to your nursing bag. To really take things up a few notches, consider getting an engraved stethoscope so that everyone knows whose bag is whose. Blood Pressure Cuff — Just like checking the heart and lungs with a stethoscope, wrapping a blood pressure cuff around a patient’s arm is a hallmark of any basic medical visit. Every nursing bag should have a blood pressure cuff, and you can even personalize yours with embroidery or emblems for some custom flair. Thermometer — A thermometer probably brings back memories of childhood fevers, but it’s an essential tool of any nurses’ bag for at-home visits for patients of all ages. Be sure to carefully dispose of plastic covering and otherwise sanitize the unit after each use. Nursing Scissors and Tape — Scissors can be used to cut a variety of materials, including medical gauze, dressings, bandages, and more. Having nursing scissors on hand means you’re always ready to address any emergency wound care. Right next to your scissors should be your medical tape, which can be used to hold an IV or bandage in place. Single-Use Items — These items are designed to be discarded after one use for sanitary reasons, and they include alcohol prep pads, adhesive remover pads, disinfectant wipes, paper towels, adhesive bandages, and personal protective items such as gowns, face masks, and face shields. Sharps Container — Because it stores used needles and other contaminated items, the sharps container shouldn’t be placed in the bag, but rather in an external pocket; it can also be carried separately. However, the sharps container is a critical part of any home nurse’s kit and should not be left behind. Tourniquet — You hope you never have the need to use a tourniquet, but if you do, you’ll want to have one or two on hand and easily accessible so you can act quickly in an emergency situation. Lotion and Hand Sanitizer — Nurses wash their hands multiple times a day, and lotion can fight dryness and prevent the skin from cracking and peeling. Additionally, hand sanitizer will help you get rid of germs of other contagious agents in a pinch. Hand Soap and Disinfectant — If you have room, bring along hand soap and disinfectant so you can clean up both your bag and yourself if necessary as you go from visit to visit. If you bought a nursing bag with a nonporous, hard exterior, you can simply wipe it down and go. Gloves — If you find yourself disposing of or otherwise handling contaminated materials, wearing disposable gloves will protect your hands and reduce the need for clean-up afterwards. Medical Books — Whether you have a physical copy or a digital version via an app on your phone, it’s always a good idea to keep reliable medical references with you in some form or fashion. Keep all of your go-to resources at arm’s reach when you stash that pocket-sized version of Gray’s Anatomy in your nursing bag. Pens and Paper — Most nurses like to carry some sort of writing instrument, whether it’s pens, pencils, highlighters, a small notebook, or a nursing clipboard, so they take notes and write down patient observations without having to fiddle with a phone or laptop. Many nurses also like to carry a penlight to provide extra illumination and assess pupil response. Now you know what to put in your nursing bag — but what’s the proper way to clean everything, and how often should you do it? 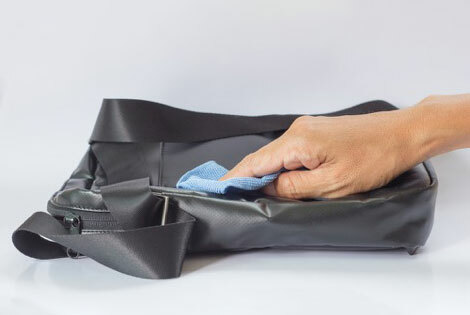 Proper bag technique revolves around preventing contamination of the bag itself, so keeping it clean and storing it in a clean environment will help you stay compliant with laws and regulations. It will also help reduce your chance of spreading bacteria. 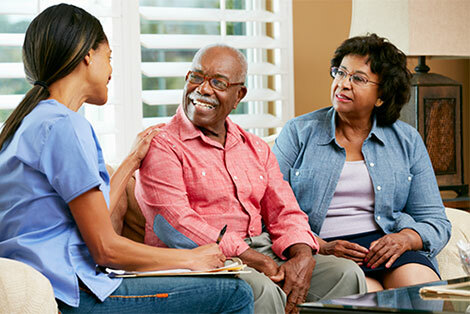 There are no nationally or internationally mandated guidelines for how often you must clean your nursing bag; each hospice and home care organization sets its own regulations. At a minimum, the bag should be cleaned once a month, and ideally it should be disinfected once a week. Of course, if the bag is visibly soiled, it should be cleaned immediately, regardless of what schedule you are on. You should also be cleaning all the reusable items that go inside the bag — your stethoscope, blood pressure cuff, thermometer, scissors and other items — on a regular basis. Ideally, these items should be disinfected after being used on each individual patient, and before you place them back in the nursing bag. Other nurses clean them daily, after the last home visit, or even weekly. As with the bag, these items should also be cleaned immediately if they are visibly soiled. Some argue that home care nursing bags should have a “clean” side and a “dirty” side, where clean and soiled items are placed back in the bag, respectively. However, “dirty” items should never go back in the nursing bag but rather be disposed of properly; this is why the sharps container is placed in an exterior pocket or carried separately from the nursing bag. Keeping used items outside the bag limits the spread of germs and other contaminants and will make cleaning the bag and its contents easier in the long run. One study found that about 84 percent of nursing bags investigated by researchers tested positive for human pathogens, with more than 48 percent of those pathogens found on the inside of the bags. 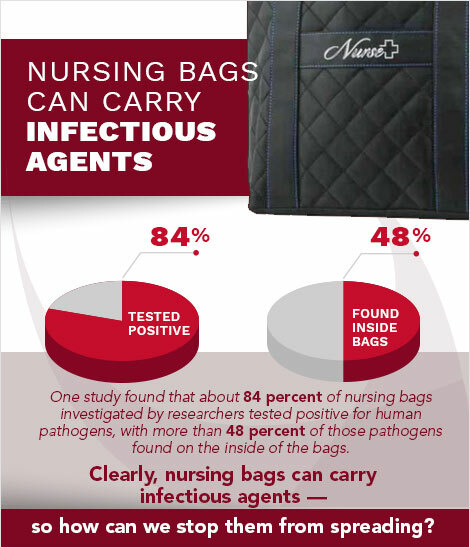 Clearly, nursing bags can carry infectious agents — so how can we stop them from spreading? Note: Be sure to wash your hands thoroughly before starting this process, and wash them as needed as you move through the steps to avoid contaminating surfaces you have already cleaned. 1. Choose Your Surface - Before beginning, find a hard, nonporous surface that you can disinfect (meaning, not a wood surface). After completing step number two, you can then place your nursing bag and its contents onto the surface. 2. Clean the Area - After you’ve staked out your spot, thoroughly clean the surface and allow the disinfectant to sit or dry for the full amount of time recommended by the manufacturer. After all, it defeats the whole purpose of cleaning out your nursing bag if you simply set everything down on a contaminated surface. 3. Remove All Contents - Take every item out of your nursing bag and set it on the disinfected surface. Turn the bag upside-down and shake it to dislodge anything that might be stuck in the bottom. This a great chance to inspect everything and make sure no items have passed their expiration dates, and to throw out any trash that might be hiding in your nursing bag. 4. Inspect the Bag - Check the bag to make sure it hasn’t been soiled and that it has no cracks, rips, or other signs of wear. If it does, you might want to look into buying a replacement nursing bag — you don’t want it to fall apart on you during a visit. 5. Wipe Down the Interior - Put on a new pair of gloves to prevent your hand from transferring any contaminants into the bag’s interior. Using a disinfectant wipe, clean the interior of the bag to remove any dirt and kill any germs that may be hiding. As in step two, allow the disinfectant to sit or dry for the full amount of time recommended by the manufacturer. 6. Clean the Exterior - As with the interior, you can wipe down the exterior of the bag by hand with a disinfectant wipe and allow it to dry for the specified amount of time. If the bag’s material allows, you can also wash it in the washing machine and then either air dry or put it in the dryer; check the bag’s tag and care instructions before putting it in the washing machine. 7. Clean the Contents - Any vital sign equipment and other reusable items should be wiped down with disinfectant and allowed to dry. The step should also be repeated for any electronic equipment used during a patient visit, such as a laptop or cell phone. 8. 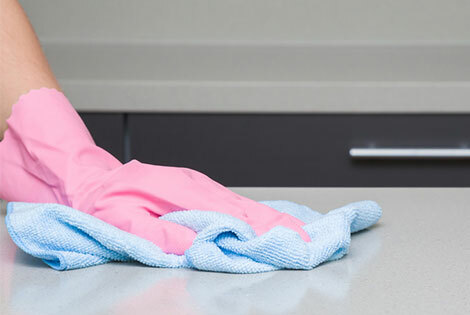 Wash Your Hands - Once you’re done disinfecting the bag and its contents, remove the gloves and thoroughly wash and dry your hands to get rid of any contaminants. 9. Restock Your Bag - If you haven’t already, throw out any items that have passed their expiration date. Place the remaining supplies back in the bag and restock any items that are getting low. Once the disinfectant is dry, place the vital sign equipment back in the bag. Proper nursing bag cleaning technique is critical for ensuring that you don’t carry contagious agents from home to home, potentially exposing a patient (not to mention yourself) to infections. By following these steps on a regular basis and using your best judgment, you’ll keep your nursing bag and its contents clean while cutting down on the spread of germs. These steps will ensure that you’ve disinfected all the areas of your nursing bag and gotten rid of any potential hazards. Of course, your nursing bag isn’t valuable just for its cleanliness, but also for the contents it holds. Our checklist will help you make sure that you haven’t forgotten anything critical, and help you pick out a sturdy, easily disinfected nursing bag if you don’t own one already. Whether it’s your first home visit or your hundredth, you can be confident that your nursing bag is disinfected correctly and stocked with everything you might need. 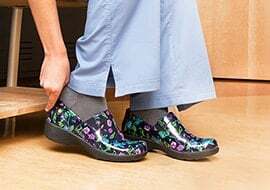 Why Do Nurses Love Dansko Shoes? Learn why nurses love their expansive collection of comfortable, durable clogs and shoes. Explore the allheart stethoscope buyer's guide to discover which stethoscope is best for your role, budget and personal needs. Get a history lesson on the otoscope and to discover how this essential medical device has transformed over time. Learn why we love Barco Uniforms and discover what the brand has to offer at allheart.com, including trendy Grey’s Anatomy™ scrubs and more. Learn the best ways to care for your legs and feet as a nurse through compression socks, comfortable shoes and self-care tips.